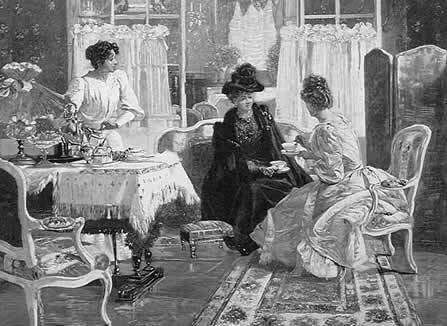 Being a good hostess was an important role of the Edwardian woman. By keeping a good home and making guests welcome she could advance her husband’s career and increase her own social status. Parties were a huge undertaking, even with servants and the hostess was expected to have planned everything down to the tiniest detail. Any mishap would be blamed on her and would severely damage her reputation. This meant that huge planning was involved, from the guest list to the entertainment. It was important for the hostess to give the party the best chance of success by selecting the correct people to attend it. If there were to be important guests, only guests of similar rank and experience could be invited. This would mean the hostess would need to do research about the personalities involved and make sure to find matching traits amongst her own associates and friends. This could get complicated by the largeness of the party and there was always the chance of the wrong guest being selected and them causing embarrassment or interfering with the flow of conversation. The role of the hostess is to mingle amongst the guests and to make sure that she has the opportunity to talk to all of them. This means being familiar with the latest world events and local gossip. The ideal hostess plans everything in advance and the meals and drink provided are carefully researched and cater to each guests taste. This research is able to be used later if she entertains the same guests again. The hostess needs to make sure that the guests have everything in their room to make the feel at home. The suggested articles are a clock, a writing desk for the guest who likes to take their correspondence with them, a sewing basket and a change of clothes. As well as practical things there should be items to keep guests entertained. A bookshelf full of books is always recommended and any interesting magazines. If there is no one of higher rank in the room, then the proper seating is to have the eldest members of the family sitting at the head of the table. latest posts with us. And spread the word!